The first purpose-built museum in America sits on Holliday Street in downtown Baltimore. In 1814, founder Rembrandt Peale threw open the doors, inviting locals to behold a “great number of Quadrupeds” and “a variety of birds [and] reptiles.” For the most part, Peale was talking about taxidermied animals posed in display cabinets. In the eighteenth and nineteenth centuries, scientists used specimens to study and classify biological life, tracing patterns that set the stage for Darwin’s theory of evolution. Museum specimens also made strange and wonderful creatures accessible to the public, inviting ordinary people to seek educational enrichment. Dead animals, however, took a back seat when their living counterparts came to town. Apollo the Grecian Dog made his first appearance at the Peale Museum in 1828, answering “questions on Geography, Astronomy, Arithmetic, and Spelling.” Apollo played chess, cards, and dominoes. He also seemed to have psychic powers, able to guess the contents of sealed boxes and the value of coins. Certainly there was a lot to marvel at, but his museum promoters asserted that there was also a lot to learn from observing Apollo. While adults ought to ponder the philosophical implications of “canine sagacity approach[ing] so near human reason,” children would eagerly absorb math and spelling lessons from “so uncommon a tutor” (perhaps anticipating the anthropomorphized animals that star in today’s educational cartoon shows). Though he possessed human-like, even super-human abilities, Apollo was still a piece of property much like a stuffed specimen. Indeed, his monetary value added to the hype: a single share of Apollo was reportedly worth $450, making a twenty-five cent ticket to his show quite a deal. “Learned” dogs, horses, and even turkeys were something of a fad in the early 1800s, as increasing pet ownership and mechanistic philosophies of mind intersected, leading people to question where the line fell between human and animal. 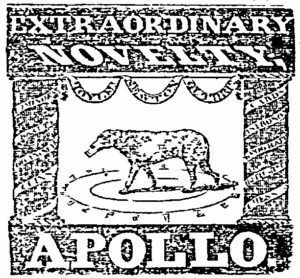 Advertisement for the “Grecian Dog Apollo,” Baltimore Gazette and Daily Advertiser, May 12, 1828. These astounding animals traveled around the country, performing in an array of hybrid gallery-theater venues that emerged in the decades before the Civil War. The curators of such spaces combined scientific curiosity with sensational showmanship, often displaying their collections in retrofitted taverns, inns, theaters, or private homes. Peale’s museum marked an ambitious milestone: he hoped to make enough money from ticket sales to pay back the construction and operating costs of his new building. But he struggled to compete in an already crowded market for wonder shows, with nearby attractions on Charles and Howard streets featuring similar spectacles. In these spaces, living and dead animals played different but complimentary roles. Scientifically-minded collectors like Peale arranged their specimens to recapitulate the divine order of nature that underpinned the Enlightenment science of the day, giving visitors a cosmic view of how the biological world was organized. In contrast, visitors who lined up to see an ostrich or a “real young sea serpent” (both featured in the Baltimore Museum on Howard St. in October of 1818) could observe the creatures’ locomotion, sounds, smells, and behaviors. Instead of just reiterating the order of nature, animals that solved math problems and played cards challenged viewers to determine for themselves what difference, if any, separated training from “actual” intelligence. 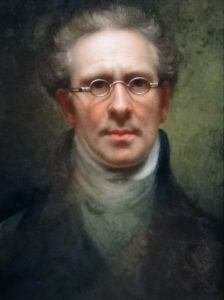 Despite the competitive market, Peale still tried to distinguish his museum as a space where wonder lead to learning and inquiry, rather than exploitative entertainment. In his advertisements, Peale emphasized that creatures were to be shown “in a very respectable manner,” and Apollo’s owners explicitly assured that the dog was “on no occasion beaten.” After marveling at the mathematical dog, Peale expected visitors to examine the carefully-labeled specimens in his natural history cabinet, his portrait gallery, and his cosmorama, all included in the price of admission. Though marquee curiosities might appear sensational, fraudulent, or, in the case of animals, inhumane, they prefigured of the now-familiar economic model of funding education and research with blockbuster attractions. Apollo performed in the grey area between museum and circus, science and entertainment, calling up larger ethical questions of how we treat animals as we attempt to enjoy or learn from them. Few people in the early 1800s objected to using animals for profit; animals did all kinds of compulsory work, and Apollo had a better deal solving equations than his compatriots who hauled freight or plowed fields. But the learned dog and his ilk dramatically demonstrated that animals might have greater capacity to learn and feel than previously imagined. If Apollo “approach[ed] so near human reason,” might he be entitled to rights? Might he suffer as humans do under exploitative conditions? Visitors to Peale’s Museum may have walked out into the warm April night in a thoughtful mood, or they may have pushed away such vexing questions with the reassurance that it was all flim-flam and trickery. Alderson, William T. Mermaids, Mummies, and Mastodons: The Emergence of the American Museum. Arlington, VA: American Association of Museums, 1991. Daly, Michael. Topsy: The Startling Story of the Crooked Tailed Elephant, P.T. Barnum, and the American Wizard, Thomas Edison. New York: Grove Atlantic, 2013. Rader, Karen A. and Victoria E.M. Cain, eds. 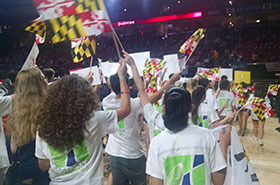 Life on Display: Revolutionizing U.S. Museums of Science and Natural History in the Twentieth Century. Chicago: University of Chicago Press, 2014. Thorsen, Liv Emma, Karen A. Rader, and Adam Dodd, eds. Animals on Display: The Creaturely in Museums, Zoos, and Natural History. University Park, PA: Penn State University Press, 2013. Tobias, Ronald B. Behemoth: The History of the Elephant in America. New York: Harper Collins, 2013. About the Author: Alicia Puglionesi is a historian and writer based in Baltimore. 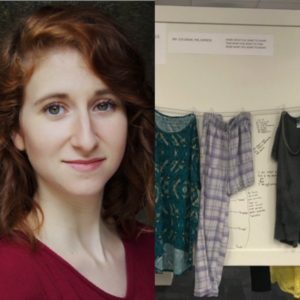 You can find her work here. To learn about the Peale Museum’s past and future as a Baltimore institution, visit www.pealecenter.org and follow it on Facebook. 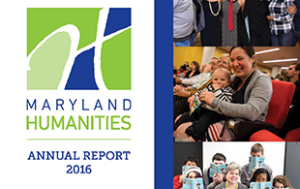 The opinions expressed by guest contributors to the Maryland Humanities blog do not necessarily reflect the position or policy of Maryland Humanities and/or any of its sponsors, partners, or funders. No official endorsement by any of these institutions should be inferred. 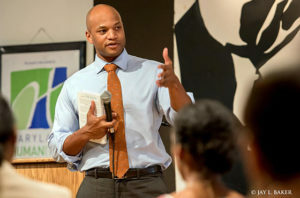 Meet the New Program Officer at Maryland Humanities!